Quality Florida Heating & Air Conditioning Installation! Few companies have been as long-lasting and influential on the HVAC industry as Rheem, and today, they continue to be a leader in high-quality products manufactured to help you control the air in your home. Nearly 100 years ago, brothers Richard and Donald Rheem founded Rheem Manufacturing Company with the mission of building quality products. Today, the Rheem family of brands is one of the most recognizable in the HVAC world thanks to their history and long-standing tradition of quality and excellence. Since their founding, Rheem has sought to push the envelope of heating and air conditioning technology. In 1956, they introduced their first central heating and air conditioning system, and pushed the envelope to improve on their technology as the years passed. Today, they have earned such distinctions as becoming the first company to introduce a complete line of 14-SEER condensing units and heat pumps. At Del-Air Heating and Air Conditioning, we’ve strived to match this commitment to excellence by providing exemplary customer service and high-quality repairs of Rheem products. Each of our technicians is highly-trained and factory certified in installing the latest and greatest in HVAC systems, and can provide you with experienced workmanship that we back up with a 100% commitment to your satisfaction. Rheem products have been pushing the industry forward for decades, and our excellence continues to be recognized with our modern products. Their 80% gas furnace platform earned the 2014 Comfortech Product Showcase award, and their 90%+ gas furnace won the award the year prior. Del-Air Heating and Air Conditioning is no stranger to awards and accolades either. We have consistently been recognized for our high-quality repair, maintenance and installation services in the community with awards such as being named the Best Air Conditioning Company by the Orlando Sentinel. And US Home has recognized us with the Outstanding Service Award. Our Central Florida heating and air conditioning experts have all been NATE and EPA certified to help your home get the comfort you seek with technology that’s great for the environment and won’t break the bank. Since 1983, our team has worked hard for you, and today, we maintain that same dedication to quality service and happy customers by being a 100% employee-owned company. 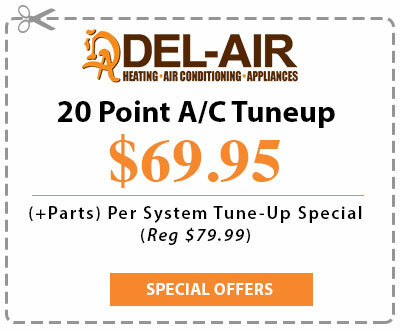 Schedule an appointment with Del-Air Heating and Air Conditioning today! Call us at (844) 574-4578.